I'll be participating in the Mistletoe Market this Saturday (under the umbrella of BookMark book store). It's quite an honor to be asked to be a vendor. 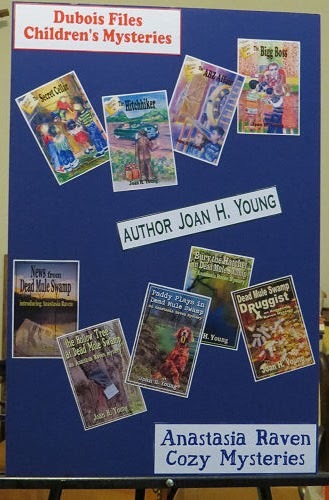 The store owner wanted me to have a poster of my fiction books, so I told him I would. Then I had to get my act together and make one! Here's how it turned out. 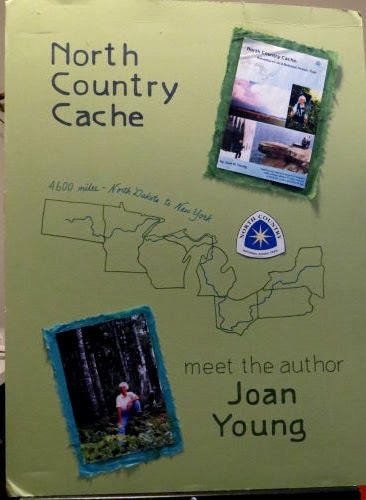 I'm also taking the poster I made when I started selling North Country Cache. It's gotten a little beat up on the corners, but I made sure the glue was still holding, and I'll take that too. Borrowed a second easel, so I'll be able to display both. The books I ordered haven't come yet, but I SHOULD be OK unless there are super-heavy sales. Didn't get a notice they'd shipped, so they probably won't come tomorrow. In other news: Picked up my stuff and my final check of the summer from Shagway. Did all right with sales. Not stunning, but some are better than none. Worked on DMS Mistletoe. Trying to get the outline of this one pretty much in hand before I write much more. I set myself a challenge with this book- the "closed community" crime scene. But I'm finding that to be quite a difficult setting to work with to keep things from gettin boring. Of course, you readers will be the ones who decide if I ultimately succeed. I do seem to be getting my head back into the workings of the story. Your poster looks great. Hope you have a successful day on Saturday.